Do you have trouble hearing the dialog on your favorite TV show? And you want to keep the house quiet because everyone else is sleeping? In the modern world there’s a technology-driven solution to almost every problem. At one time that would have meant using the mute button and turning on the closed captioning feature. Now it means using a pair of headphones. That’s why I’ve created this list of the best wireless headphones for TV in 2018. Even if you have no such issues I mentioned above, it can be a transformative experience to have the sound pumped directly into your ears. The reviews below should help you make the right choice. Founded in Germany just after the end of World War II, Sennheiser has been at the forefront of microphone and headphone technology since its inception and works tirelessly to ensure their customers are treated to the highest quality experience imaginable. That’s part of why I was genuinely excited when the Sennheiser RS 175 wireless headphones arrived at my door. Sometimes being a reviewer is a thrill and these delivered in a big way. This has happened with many of the wireless headsets I’ve reviewed, but the initial charging phase took an oddly long time with the RS 175s. I don’t know if the charger/transmitter is poorly designed or they actually want it to take a long time, but it’s frustrating. I ended up using a pair of fully charged batteries because I wanted to get on with the show. I put one in each ear piece (it’s annoying to pull off the padding and pop in the batteries, but thankfully that’s not something that should have to be done with any kind of frequency), plugged the transmitter into my cable box, and relaxed on the couch to experience pure audio heaven. When I say it was bliss I feel like I’m understating it. This was an exceptionally pleasing experience. Above all else the sound quality is top notch and that’s precisely why you pay so much for them. Sennheiser has a reputation for crafting headphones that last for upwards of a decade, so if you amortize the cost over that period it turns out to be an excellent deal (I realize the upfront fee is simply going to be too much for some people). If you have the extra room in your budget for a purchase like this it’s well worth it. My favorite thing about the Sennheiser RS 175 headphones is the virtual surround sound modes they include. With the click of a button on the side of the headphone I can change the sound experience and it’s actually pretty mind blowing. If you’ve seen a movie recently then you know what surround sound is like. With it happening right in your headphones it’s even better and you can cycle through several options to get the exact experience you’re looking for. You can also turn up the bass if you prefer that deeper, pounding sound that’s especially good for action movies and chase scenes on TV shows. Because the sound quality was so excellent I decided to try the Sennheiser RS 175s for music. I plugged the receiver into my stereo system (which is playing music off my iPod; I’m so modern), popped the headphones on, and once again was transported to a world of bliss. Even if you’re not an audiophile you’ll immediately appreciate the differences here and will no doubt be blown away by what they’ve been able to accomplish with the Sennheiser RS 175. They’re ideal for watching TV and movies and listening to music. The rest of the house will be quiet and you’ll be lost in a powerful audio experience and deeply immersed in your chosen form of entertainment. That’s well worth the investment. Virtual surround sound modes for an incredible experience. Headphones can feel a little tight around the head. First charge of the batteries takes a long time. Is it really possible to get an excellent pair of wireless stereo headphones for a low price? The makers of the RCA WHP141B stereo headphones believe it is and after trying out a pair for the last couple of weeks I feel comfortable recommending them for anyone looking for a bargain. I feel like it’s important to note that these are budget headphones, at least as far as the pairs reviewed on the site. That doesn’t mean they’re bad, but for this price you’re not getting the same kind of sound quality as you would from a $300 pair. They’re not bad though! Just keep in mind when you’re reading and considering buying that to a certain degree you’re getting what you pay for. The RCA WHP141Bs come with a compact charging base/transmitter that you plug into the wall socket and into your TV or cable box. It took about a day to charge them (I’ll admit to being a touch annoyed that I had to charge them before I could use the headphones) but after that first time I would just put them on the charger at night and never came close to running out of juice. RCA says they last 10-20 hours, which is enough time unless you are the most dedicated TV watcher/music listener on the planet. If you need more time buy a second pair of rechargeable batteries. Most people, myself included, will use the RCA WHP141B, to watch TV while keeping the rest of the house quiet. They’re quite good for that purpose, with only a few minor complaints. During quiet moments during a show I could often hear a faint hiss. That happens with almost every pair of headphones designed for watching TV wirelessly, which is a shame. I dealt with it by adjusting the frequency dial and then turning up the source volume, which seemed to largely take care of the problem. The headset itself also could have been a little more comfortable. That’s the sort of thing you don’t really get unless you’re paying more, however, because the better materials and more intensive design simply cost more money. Ultimately, I highly recommend the RCA WHP141B wireless headphones if you’re looking for a low cost option. They get reception up to 150 feet away as long as there aren’t too many walls between you and the transmitter, so they should allow you to move around the house with ease. 10-20 hours of use between charges. Easy to tune to your TV’s signal. Have to charge for a while before using. Only 150 feet of reception. Have you ever talked to an audio snob, the kind of person that will wax rhapsodically about how vinyl is superior to every other kind of music, about how surround sound is the only way to watch movies and TV, about how you’re missing out if you’re not experiencing superior sound? Nobody really likes that person, but if you put on a pair of Sennheiser RS 185 wireless headphones you might just become one. By their own admission, Sennheiser designed the RS 185 headphones for the music lover. They still work for watching television and movies, of course. What that really means is that they concentrated all their efforts on providing the best listening experience possible for their customers and the difference over a pair of earbuds or even a high quality pair of headphones is remarkable. The transmitter/charger is a tall, sleek black tower that will have to rest next to your TV or music system so it can be plugged in with ease. After that it’s time to enjoy the beautiful sounds that Sennheiser has crafted. The exceptional design of the RS 185 goes a long way towards ensuring a great listening experience. They’ve used an open back, around the ear style that provides maximum comfort for the wearer while delivering only the highest quality sound to your ears. On the right ear you’ll find the controls that let you adjust the volume and balance of what you’re listening to. You can also choose to automatically or manually control the volume levels based on different input devices. Thankfully, the whole system is simple so you really just have to put them on, get the volume where you want it, and enjoy the listening experience. The one downside I’ve noticed is that the headphones are fairly tight around the ears, so over long periods of time they can make your ears a little sore (though I have really big ears, so that might be a greater problem for me than most people). Sennheiser, like every other manufacturer of wireless headphones, states that you can get clear reception up to 330 feet away from the transmitter, but that really means unobstructed. As soon as you go into another room that number goes out the window. It’s a silly thing to brag about, but thankfully it doesn’t matter because if you’re walking around the house while listening to music you’re still going to get crystal clear reception, unless you live in some sort of wacky, monstrous mansion. The batteries last 15-20 hours before they absolutely must be recharged, though you should really be putting the headphones on the charger every night to ensure they never die. Sennheiser has outdone themselves with the RS 185. They’ve advanced their technology and delivered a superior listening performance. The only real question should be if you’re willing to invest the money to purchase these. It’s worth it if you can afford it, so if you’re serious about the highest quality listening experience you should go for it. Open back, around the ear style design ensures high quality sound. Easy volume controls on the ear phones. Long battery life and easy recharging. Option to add another pair of headphones to the charging base. Compatible with most sound devices. Headphones feel a little tight around the ears. You get your money’s worth, but it can still feel like too much. Might turn you into an audio snob :). I’ve actually had the experience of watching a show over wireless headphones and noticing a hugely annoying sound delay. The actor says something but it’s not in my ears until half a second later, so the whole show features an astoundingly annoying sound delay that is entirely due to latency, a feature that some Bluetooth wireless headphone manufacturers forget to deal with. I mention all of this because Avantree has a solution in a pair of wireless headphones that retail for less than you may think. The lack of sound delay with a Bluetooth wireless headphones is the big selling point of the Avantrees and you’ll see it everywhere in the marketing materials. They’ve smartly identified a problem that needs solving and have leaped headlong into it while attempting to shame the other companies that have screwed this up and rightfully so. Luckily, they’ve designed an excellent pair of headphones so you won’t be making any massive compromises when it comes to sound quality or comfort either. It’s worth noting that these are genuine over ear headphones, something many manufacturers claim but surprisingly few actually design (such a strange thing about headphones). Some users with particularly small heads have complained about them actually being a little too big, a slight oversight on the part of Avantree as they made the headband too large for some users. Most of you will be fine though. In addition to being over the ear, the headphones are exceptionally soft and comfortable and do an admirable job of blocking outside noise while still making it possible to hear if the phone is ringing or your significant other is yelling for you. They’re not at all sweat resistant though, so you’ll need another solution if you’re looking for workout headphones. They use 40mm drivers that provide excellent sound quality including strong bass. You’ll have no trouble hearing the dialogue for your favorite shows and the sound effects will come through crisp and clear. Plus, these wireless headphones are excellent for listening to music if you want to pair them with your phone. They offer an incredible 40 hour battery time with just one charge, meaning if you forget to hook them up for charging one night it’s not going to be a big deal. The packaging comes with the wireless Bluetooth headphones, a micro USB charging cable (can be plugged into an outlet with an adapter or your computer), a soft zippered case (it’s worth getting a hard case if you’re going to be traveling a lot), a 3.5mm audio cable if you want to plug them in, and a manual. It’s important to note that your TV needs to be Bluetooth compatible to use these out of the box. If not you’ll need to buy an adapter that will run you roughly $40. If you’ve dealt with wireless headphones that cause a sound sync delay when watching TV and movies you know how enormously frustrating it can be. It’s more common than you might think, which is why the Avantree Wireless Bluetooth Over Ear Headphones are worth the investment. They’re reasonably priced, they’re exceptionally comfortable, and they deliver top notch sound with a 40 hour battery life that should keep you watching TV and listening to music for as long as you’d like. Your TV needs to be Bluetooth compatible or you have to buy an adapter. Headband is too large for people with small heads. It was in 1982 that Sennheiser made their first foray into wireless sound technology when they began selling wireless microphones, which is my way of saying that they have a ton of experience in this market. They’ve been working tirelessly ever since to improve their products and show that German engineering is unsurpassed the world over. For their RS 195 RF wireless headphones they’ve collaborated with the Fraunhofer Institute for Digital Media Technology to cater specifically to customers that have experienced a decline in the quality of their hearing and need a little help to pick up dialogue and the subtler sounds in movies and TV shows. I won’t pretend to understand the technology they’ve developed. I can say that it works exceptionally well though. Through a button on the side of the right earphone you select ‘Speech Mode’ and the headphones eliminate some of the background noise that would otherwise obscure the dialogue and just like that you can hear what people are saying clearly and consistently. For the first few days with the RS 195 RF headphones I found myself doing it randomly and being utterly thrilled at the obvious differences I could hear. If you have hearing issues of the nature described above then you should definitely spring for the 195s because they will genuinely change your television viewing experience. Now, I don’t want to make it sound like the only reason to buy the Sennheiser RS 195 is if you can’t hear dialogue during TV shows. That’s their most unique feature, but this is a high quality pair of headphones through and through. You can hit that same mode button to change the settings to ‘Music Mode’ and experience an enhanced version of the typical Sennheiser sound quality. Everything sounds crisp, the volume control is as simple as tapping the button on the side of the earphone, and with the exceptional design it will feel like you’re in your own personal surround sound theater. The Sennheiser RS 195’s most significant drawback is the price. So, that depends entirely on your budget, but considering that they’re built to last for several years (some users have complained about them dying in a significantly shorter time) they can be viewed as a good investment in your TV and movie viewing experiences. The other significant downside is that they’re awfully tight around my head and ears. This is an unfortunate side effect of trying to provide the highest quality sound experience, but it can be frustrating if you’re settling in for a long viewing experience (a three and a half hour football game, for example). The Sennheiser RS 195 solve the problem of hard to hear dialogue in movies and TV shows and do it with the push of a button. That alone will make them worth the purchase price for some people, and if you need another reason then consider that they also provide the highest quality sound you can find in a set of headphones. Believe me, I understand that the price point is high, but if you’ve got that kind of money to invest you’re not going to find a better way to spend it than on these amazing headphones. Speech Mode makes dialogue in movies and TV shows clearer. Music Mode adds clarity to the sonic bliss your favorite bands create. Highest quality sound experience available. Soft padding and a lovely headset design. Touch of a button switching between modes. These are expensive, though they’re the best. Headphones can feel tight around the ears. When reviewing and writing about products like wireless headphones you have to take cost into consideration. For instance, the Sony MDRRF985RK are very well priced and provide a sound experience equivalent to high end wireless headphones that will run you upwards of $200, making them an exceptional deal from a company with decades of experience producing electronics the world has come to love. Comfort is key when it comes to wireless headphones you’re going to be using for watching TV and movies at home, so it’s to their credit that Sony has gone to great lengths to make wearing the MDRRF985RKs as comfortable as possible. The soft padding around the earphones, which should comfortably fit around your ears, feels exceptional. There’s padding all around the device, in fact, so as they rest on the top of your head they should feel equally excellent. They’re not too tight, either, which is a problem some headphones run into. Setup was a breeze. The charging base, which is a simple black plastic tower that you can hang your headphones on to restore the battery life, sits next to your TV and just needs to be plugged in to work immediately. 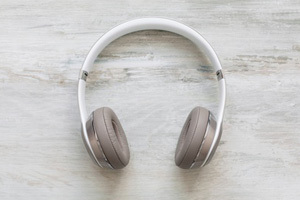 The headphones feature automatic tuning, which theoretically prevents you from having to fiddle with the signal to find sound quality free of interference (which is a constant bugaboo for users of wireless headphones). It worked for me and I haven’t seen any complaints online, which is rather remarkable, so kudos to Sony for their excellent design work. For most wireless, rechargeable headphones you can replace the batteries, but Sony has decided not to allow that for the MDRRF985RKs. This is likely because they use a different battery than most manufacturers, but having to go to the store if they die would be a massive pain. Ultimately, the value of a pair of wireless headphones rests almost entirely in their ability to deliver a good listening experience and the Sony MDRRF985RK headphones come through in every way that matters. The sound quality is excellent. Dialogue in shows is crisp and clean, the bass is at the perfect level, and I picked up sound effects I had never noticed before. All told it was delightful and I’m thrilled with the value provided at that price. If you’re an absolute audiophile you should spring for a higher level set of headphones, but if you’re not the type to notice those small differences then you’ll be pleased with the Sony headphones. Auto tuning makes finding a good signal easy. Noise cancelling feature works very well. Can’t replace the batteries yourself. Sound quality suffers a bit when you move from the transmitter. Wireless headphones for TV viewing are often sold as single items. Most manufacturers give you the option of buying a second pair and using them through the same transmitter, but in some cases that can add an extra $200-300 to your total cost. That’s a lot to swallow no matter your financial situation, but it’s a virtual impossibility if you’re on a tight budget. The Power Acoustik HP902R aims to solve that problem by giving you two sets of headphones along with the transmitter for much less. It’s important to be honest with these sorts of reviews, so I have to say that with electronics you almost always get what you pay for. That doesn’t mean these headphones are bad – by no means are they bad – but it does mean that they’re not up to the quality offered by Sennheiser or Bose. That shouldn’t be terribly surprising though. They’re simply constructed and designed units. They’re not quite around the ear (background noise won’t be muffled all that much, so you’ll need another brand if that’s what you’re seeking), but they’re quite comfortable and rest softly on the head. The sound quality is good but it does come up short of greatness. One of the issues with wireless headphones is that on the lower end of the price spectrum you tend to get more interference. You’ll hear hissing and the occasional pop and if you have a bad mixture of signal interference in your neighborhood or house it might be very difficult to enjoy the headphones. That tends to work on a case by case basis so it’s hard to say if you’re likely to encounter such issues. If not I suspect you’ll be perfectly happy with the Power Acoustik HP902R headphones. Everyone that purchases a set of the Power Acoustik HP902R headphones will experience the same issue that has angered so many people online: The package does not come with a power cord or batteries for the headphones, which means your cost will increase. It’s also not entirely clear that it doesn’t come with those things, so people don’t often know before purchasing. You know now, but it doesn’t ease the frustration of having to spend more because they didn’t want to include the basics in their packaging. The Power Acoustik HP902R earn a recommendation if you’re shopping on a budget and looking for a low cost set of headphones. You’ll get two, they’ll be comfortable enough, and chances are good the sound quality will be what you’re looking for. It’s not a great pair of headphones by any means, but they will get the job done if you want to save money. Two sets of headphones for a really low price. Hard to beat that. Packaging doesn’t include power cord or batteries. Headphones could be more durable. The Sennheiser RS 120 Wireless RF Headphones land right in the middle of the pack in terms of price (though sometimes they’re on sale for an exceptional bargain), so the chief question we need to answer is do they provide good value for the money they’re asking. Admittedly, I was a touch disappointed by the design of the headphones, mostly because I prefer an over-ear style, whereas these merely rest on the ears. The sound quality is roughly the same, but they’re not great at canceling out noise if that’s a concern (sometimes it is for me). The package comes with the headphones and the charger/transmitter included. I recommend plugging the transmitter right into your cable box because if you plug it into the TV you might have to unplug it each time you want to use your TV’s speakers. The RS120 charging dock looks good sitting on my TV stand and the headphones can be placed on it whenever they need to be charged. I was pleased to note that it’s so much easier to appreciate the sound design of movies and TV shows while watching with my headphones on. The exceptional sound quality means I can hear every little thing and it makes a difference in my viewing experience I never would have expected. They’re comfortable enough, though I still prefer a thick, over ear design for long term use. You can apparently purchase a separate pair of add-on pads to soften the feel against your ear, though the added expense is a touch annoying. Sennheiser claims you can get reception up to 300 feet from the transmitter, so you could theoretically watch a TV all the way at the opposite end of a football field. Perhaps you’ve got the world’s biggest house or you really like watching TV outside through the living room window. I’m being cheeky, of course, because what’s important is that there’s rarely interference or issues inside the house. If you have to run to the kitchen and just want to keep your headphones on, feel free to do so without running into any issues. From time to time, especially when I get further from the transmitter, I notice a slight hissing sound. Turning up the volume on the TV and turning down the volume on the headphones usually takes care of this. The sound is the thing with any pair of Sennheiser headphones and they’ve nailed it here. It’s not quite as full and amazing as their headphones that run close to $300, but of course it’s not. You’re shopping at a much lower price point when you’re buying the RS120s, but you’re getting more than what you pay for if you ask me. A two year warranty is included in case there are any equipment failures (these do not include you sitting on the headphones or stepping on them, sadly), so your investment is protected should you choose to purchase these. Sennheiser quality at a low cost. Up to 20 hours of listening between charges. Move from room to room with reception. Headphone design could be more comfortable. Slight hissing sound when far from the transmitter. In 2014 Bose released their SoundLink Over-Ear Wireless Headphones to acclaim. But, as is typical of the company, they weren’t satisfied with the results. That’s where the second version of these headphones comes in. Released less than a year later, the SoundLink II have replaced the old model and have garnered the same level of acclaim. I’ve been wearing them for two weeks now and I’m ready to join the chorus of people that love what Bose has done. It should be noted that these are not designed specifically with TV watching in mind. They’re made with your smartphone and computer, primarily, though they can be used with any Bluetooth device. They also come with a cord if you’d simply prefer to plug them into your phone or computer, though you’re kind of defeating the point if you do. The lightweight nature of the headphones was the first thing that stood out to me. I’ve owned and reviewed dozens of pairs of around ear headphones over the years and these are exceptionally light while still managing to block out a fair amount of outside noise. It should go without saying that the sound quality is top notch. That’s what Bose does and has always done. They deliver beautiful sound with their products and the SoundLink IIs are no exception. The battery life is up to 15 hours, and if you happen to run out you can juice them up for 2 hours of play time with just 15 minutes of charging time, which is done by plugging in the included USB charging cable. They’re remarkably good for taking calls as they provide crystal clear sound and the microphone actually broadcasts flawless sound to whomever you’re talking to. I enjoyed the feature that lets me connect to two devices at the same time, though depending on which devices I was using I would come across sound issues that meant disconnecting from one of them. Sometimes I get a little clumsy, which is one of the reasons why I’ve owned so many headphones. I was pleased to discover, through lots of dropping, that the Bose SoundLink II headphones are built to withstand abuse. Once I dropped them and onсe I kicked them because I had stupidly left them on the floor. In both cases they held up fine. It feels like the Bose SoundLink II bring together everything this company does so well. The sound quality is incredible, the headphones are exceptionally comfortable and durable, and the Bluetooth technology works flawlessly. They’re better than almost any other headphone in their class, with the most significant downside being their cost. You get what you pay for. Great sound quality Bose is known for. Connect to two devices at once. You get your money’s worth, but these cost a lot. Connecting to two devices doesn’t always work flawlessly. Sennheiser is a market leader in the wireless headphones geared for watching television market (that’s quite a mouthful). They have a surprising number of options, each at a different price point, and each with a different array of features. They’re all built off the same basic technology and they look and feel relatively similar. For the most part the cheaper they are the fewer bells and whistles they have. The Sennheiser RS 165 headphones are among their lower-priced offerings, but they’re not exactly cheap, which means you get a whole lot of bang for your buck and will come away feeling like you’ve both gotten a bargain and have spent your money wisely on a high quality, darn near luxury experience. As they say in their promotional material for the headphones, the RS 165 RFs are designed to be used for music, movies, and TV shows without wires and without making a sound. That last part is what they’re most commonly used for and they’re at the perfect price point for quality and affordability (within reason, I suppose). The headphones are compatible with any device that has an analog audio output, which includes basically every TV or stereo system, so you’re almost certainly good to go. As a nice bonus, you can add a second set of headphones to be used with the same transmitter (they’re not cheap, of course). As a company, Sennheiser’s mission statement is that they’re in pursuit of the perfect sound and the RS 165 RF wireless headphones are an excellent example of how they’re pretty close to achieving it. The experience of putting on the headphones for the first time and firing up a TV show (in my case it was an old episode of Serenity, the Joss Whedon science fiction show with Nathan Fillion) was incredible. The outside world recedes into the background when I place the soft, leather-feeling cups around my ears. Even loud noise becomes just a dull hum. Starting the show was something else entirely. It was like watching it for the first time again because it felt so different. Durability is an oft-overlooked component to a headphone purchasing decision. If they break it doesn’t matter how little or how much they cost because they’re garbage at that point. The Sennheiser RS 165s are exceptionally well-constructed, in keeping with the company’s reputation, and were able to withstand a fair bit of accidental abuse on my part. The most common complaint with them, and I experienced this too, is that you can’t get terribly far from the transmitter without sound problems. This means the 165s are probably best used if you’re planning on staying in the same room while watching TV or listening to music. It can be dizzying to survey the list of options Sennheiser has for wireless headphones meant for watching TV and listening to music. Ultimately it’s pretty simple. They start with the entry level headphones, the 165s, and work their way up the cost ladder. Each version has a few more bells and whistles. I’m reviewing the basic model now and I’ve been impressed. The sound quality is top notch, they’re comfortable, they drown out the outside world very well, and they’re durable. You get your money’s worth here and that’s hugely important. Excellent price for what you’re getting. Great sound from a top notch company. Compatible with any device that features an audio output. Could be too expensive for some budgets. Wireless sound doesn’t travel as far as would be ideal. What Are Wireless Headphones for TV and Why Would You Want a Pair? Using a transmitter that you plug into your TV, cable box, or audio receiver, you can listen to your television through a pair of high quality headphones. 1. If you have hearing loss that makes it difficult to hear the TV. 2. If you want to watch TV without disturbing the other members of the house. The first case is most often with older men and women that have seen a decline in their ability to hear clearly. 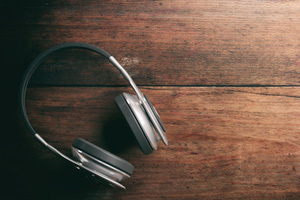 Understanding dialogue is often difficult in these cases and a good pair of headphones, especially those with settings designed to enhance dialogue on TV, are an excellent choice. The second case is common when there’s a baby or children that need to sleep without the excess noise of a television or a couple that goes to bed at different times. No matter the reason, wireless headphones provide a perfect solution to these issues. Those aren’t the only reasons people purchase headphones for TV. If you want an unsurpassed audio experience you might consider them. Some of the higher end Sennheiser and Bose options feature beautiful, crystal clear sound and noise cancelling design that can enhance your movie and TV viewing experiences in ways you might not have thought possible. If you can’t afford or don’t want an in home surround sound setup you can get the same effect with a pair of great headphones and enjoy a movie theater quality experience anytime. In general, buying wireless headphones for TV is not a low cost endeavor. However, there are a few options that fall on the cheaper end of the spectrum if you’re looking to keep your costs relatively low. This will come up repeatedly, but it’s important to keep in mind that you generally get what you pay for when it comes to technological devices, so low cost means you’re not getting all the bells and whistles and there might be issues with reception and sound quality. RCA WHP141B – They provide reliably clear sound with no bells and whistles. A true budget version. Power Acoustik HP902R – Two headphones for a low price. However, the package does not come with a power cord or batteries. 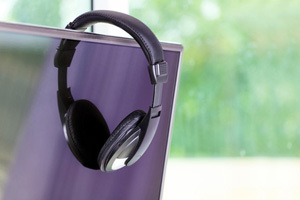 The construction could be better as many users have complained of the headphones breaking. 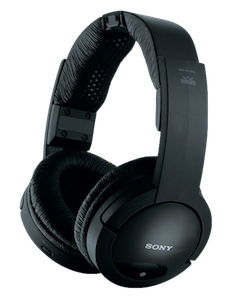 Sony MDRRF985RK – More expensive, Sony offers their lower end version that offers a typically high quality experience. The headphones are well-designed and exceptionally comfortable. Sennheiser RS 120 – Most of Sennheiser’s options are in the high end price bracket, but the RS120s come in quite a bit cheaper and offer you that exceptional German sound engineering for a reasonable price. These are an excellent way to get quality while sticking to a reasonable budget. Avantree – These headphones are notable for having eliminated the sound sync issues that plague so many Bluetooth headphones. They’ve gotten it below what’s noticeable by the human ear and that’s all you need. They’re comfortable and they produce terrific sound. If you happen to have a little more money in your budget, there are several good options that deliver an exceptional experience. In general you can expect higher quality sound, fewer issues with transmission, and more options to customize your listening experience. 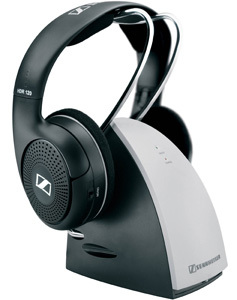 Sennheiser RS 165 – Sennheiser makes several appearances on this list of the best wireless headphones for TV because they are among the industry leaders. They were one of the first companies to patent wireless sound technologies, beginning with microphones, and they’ve developed an excellent system for TV watching with headphones. The RS 165 is a notch above their cheapest model and delivers good sound and excellent features. Sennheiser RS 175 – With virtual surround sound modes and variable bass options, the RS 175 headphones give you options for customizing your experience as you see fit. Sennheiser RS 185 – This is where Sennheiser starts to get into the realm of audio bliss. These are pricey, but the sound is exceptional and the fit around your ears guarantees a great listening experience. All their wireless headphone and charger setups allow you to add a second pair of headphones without needing a second charger. Sennheiser RS 195 – The Sennheiser RS 195 headphones offer a mode designed to make it easier to understand dialogue in TV shows and movies. With the touch of a button you can activate it. They also offer a music mode to enhance the quality of your favorite songs. Bose SoundLink II – Bose has long been an industry leader in sound technology thanks to their tireless dedication to being the best. Their SoundLink II headphones are an advance on the previous version and offer connection to any device that works with Bluetooth. You can even connect to two devices at once. Before you begin your wireless headphone shopping experience it’s important to assess your needs. If you have trouble hearing dialogue on TV then you’ll be best served with one of the higher end pairs that offer an option to enhance dialogue. If your hearing is fine and you simply want better sound, then choose headphones that give you multiple sound-customization options to ensure the best listening experience possible. Before you buy make sure you know exactly what you’re looking for. Then, read the reviews and see which pair of headphones meets your needs. I know that for some (perhaps many or most) of you this decision will come down to budget. It would be nice if we could all spend $300 on a pair of high end wireless headphones when we want to, but that’s not always possible unfortunately. If you can’t afford everything you want in a pair of headphones you need to assess which are the most important features to have and eliminate the pairs that don’t meet them. We’ve crafted each review to be helpful, informative, and hopefully a little bit entertaining and by the time you’re done reading you should be able to make the right choice. Ultimately, we’ve selected ten excellent examples of the best wireless headphones for TV. There are dozens to choose from, but these represent quality across the cost spectrum, from the RCAs to the splendid Sennheiser RS 195s that require opening your wallet to shell out a few hundred bucks in exchange for a world class listening experience and their unique technology. No matter your budget, there’s no reason to suffer through irritations regarding watching television at home. You don’t have to bother your spouse while they’re trying to sleep. You don’t have to wake up the baby. You don’t have to drive your downstairs neighbor crazy with your bass-infused action movie anymore. Just plug in your wireless, rechargeable headphones and experience the bliss that is a brand new listening experience.